7) Voices of Liberty and The American Adventure – The America Pavilion is the host pavilion of World Showcase and it is patriotically themed with red, white, and blue details, beautiful colonial architecture, fountains, and more. Guests who are spending time in World Showcase simply must enjoy two amazing experiences in the America Pavilion that are conveniently located in the same place. The main building of the pavilion is home to The American Adventure, a gorgeous stage show that tells the story of the American people through music, artwork, photographs, audio-animatronics, and highlights of the most important historical moments for our country. Before enjoying the amazing attraction, guests can wait inside a beautiful rotunda that features artwork depicting the development of America alongside inspirational quotes. 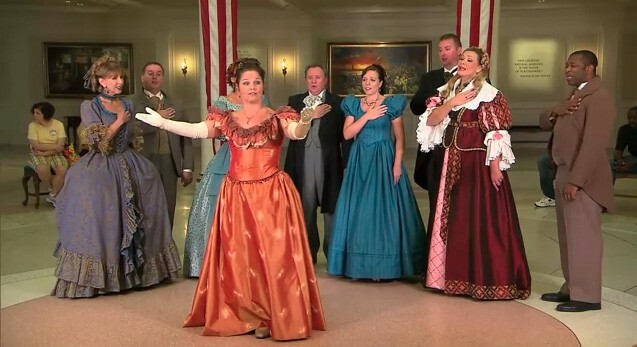 While waiting in the rotunda for each show to start, guests can listen to the Voices of Liberty, an a cappella group who perform colonial and revolutionary classics decked out in historically accurate attire. Guests simply must enjoy the Voices of Liberty and The American Adventure when in World Showcase!